New York, NY—Yesterday, Robin Hood, New York City’s largest poverty-fighting organization, brought together nearly 50,000 people to help the city’s most vulnerable residents. Longtime Robin Hood donors and new supporters gathered in person at events across the city, including the organization’s benefit, a Yankees game, two concerts, several restaurants, and at community service efforts, while supporters rallied online around . 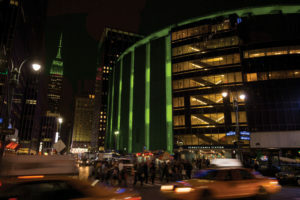 At nightfall, in a spirit of solidarity, the Empire State building, the Bloomberg building, the Nasdaq billboard in Times Square, and Madison Square Garden turned Robin Hood green. The citywide effort raised $61.2 million to fight poverty, pushing the total amount raised since Robin Hood’s founding in 1988 to over $2.5 billion. Robin Hood is New York’s largest private funder of schools, emergency food programs, homeless shelters and job training services. The organization’s board underwrites all operating costs, so 100% of donations go directly to serving New Yorkers in need. The nucleus of the night was the benefit at the Javits Center where nearly 4,000 people gathered to help launch a groundbreaking early childhood learning initiative that will tap into the latest breakthroughs in brain science. For the first time, research has provided a vivid window into the rapid growth of a child’s brain during their earliest years and the damaging effects of under-stimulation or the extreme stresses of poverty. Gaps begin to appear as early as three years old and statistics show the further behind poor children fall, the more likely they are to suffer in the long term. In New York City, over 150,000 children under five live in poverty. Board member Katie Couric hosted the benefit, while eight-time Grammy winner Usher, three-time Grammy award winners the Zac Brown Band, and comic stand-up star Jim Gaffigan performed. Governor Andrew M. Cuomo spoke of Robin Hood’s role as a disruptive force. Benefit co-chairs were Jane and Mark Fields of Ford Motor Company, David M. Cote and Maureen Kelly of Honeywell, Sarahmay and Larry Robbins of Glenview Capital Management, and Nancy and Howard Marks of Oaktree Capital Management. In addition to the benefit, Robin Hood’s May 9 efforts included a Nasdaq opening bell ceremony with The Children’s Aid Society; a Yankees vs. Royals game where 10,000 people served by Robin Hood funded organizations received free tickets to the game, thanks to PepsiCo; mobilization of Robin Hood’s Teen Council, two concerts for the next-generation made possible by BlackRock, donation of a vehicle to New York Common Pantry by Ford Motor Company and donation of the evening’s cocktail sales to Robin Hood by four Brooklyn restaurants. Organizations of all kinds have stepped up to donate money, products, services and time to the effort.